For a long time now, I’ve had an idea for a floor plan in my head. My husband and I love architecture and looking at homes, and we’ve been talking about what a small retirement home might look like. After months and months of thinking about it, I finally had a window of time on a Sunday afternoon to sit down and sketch it out. Before I tell you more, I have to confess something; I am not a good drawer. I think people assume that because I am an artist and paint for a living, that I am a good drawer. I think I am more of a doodler. I’ve always been more interested in mixing color and creating dimension and shapes with paint then laboring over a drawing. Even in art school, I’d rush through the drawing part. So there I was, sitting at the table sketching out a floor plan, which lead to wondering what would the front elevation of this home would look like. So I drew that too. I added landscaping, and then I did a sketch of the bedroom and the kitchen. Finally, I drew a fun sketch of what the view might look like if were standing out in the back yard. For fun I opened all the sliding windows and put guests (stick figures) inside at the dinner table. I put more people around the fire pit and sitting by the river (yes my dream home would have a river running though the back yard). As I worked, time flew. Several hours went by and I felt energized. The drawing I produced that afternoon will not win any prizes. The perspectives are not quite right and there is no fancy shading, but the focused, creative, act of sketching was invigorating. At dinner I shared my work with my family. My daughter was particularly enamored with what I had designed. She went off into the studio to create her own floor plans to go with a science fiction story she is writing. This got me thinking. I should sketch more often. I should get a small sketch book and carry it with me. I should get it out when I’ve got time to kill at a coffee shop and jot down ideas or just do a study of my coffee mug to sharpen my skills and rest my brain. I should treat myself to the satisfaction of really LOOKING at something instead of quickly snapping a cell phone photo and then forgetting about it. Over the years I have also made little sketches in my travel journal. They are simple sketches of the view from a balcony or whatever, and honestly they seem to take me back to a moment better than a photograph. So, I resolved to sketch. I ran to Hobby Lobby a bought a fresh, portable sketch book. I sharpened a Cinderella pencil. No need to charge a battery. If I want to “share” my sketches I’ll tear them out and give them away. If I want to “pin” them, I’ll do so, on my bulletin board. They won’t be perfect, there is no photo shop. Simple. Isn’t that what we are craving these days? Simplicity? Maybe you’ll join me in this adventure. 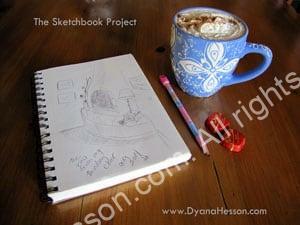 Whether you are an artist or an accountant, there is room in your life for a good, honest, doodle. A mark made by your hand will be unlike anyone else’s. Before you know it you’ll have a book full of “one of kinds.” Isn’t that, after all, what God did when he doodled you into existence? He made a one of a kind too. No eraser needed.